The upscale command is used to interpolate attribute values from nodes of a fine source mesh to node attributes of a coarse sink mesh. The subroutine finds nodes of the fine source mesh within the Voronoi cell of every node in the coarser sink mesh. Nodes on cell boundaries are assigned to two or more sink nodes. Then the attributes of all the source nodes within a source node’s cell are upscaled into a single value based on the chosen method. Mesh elements and connectivity are ignored and only node values are used to upscale values on to the sink mesh nodes. A kdtree node search is used to find the source mesh nodes located in each of the Voronoi sink point volumes. It is possible for source nodes to occur on the boundary of multiple Voronoi volumes. By default, all nodes found in each Voronoi volume are used to upscale to the enclosed sink node. In this case, source nodes on multiple Voronoi boundaries will be included in upscale calculations more than once. The keyword option single can be used for situations that require the sum of nodes in each Voronoi space to equal the total of source points used. This one-to-one correspondence is written to the source cmo attribute pt_gtg. This attribute can be reused during multiple calls to the upscale command and will greatly reduce CPU time. The keyword that allows the attributes to be kept as part of the sink cmo is keepatt. Note that information regarding duplicate nodes on Voronoi volume boundaries will be lost if the pt_gtg is used instead of the default search. The upscale method options provide choices for the calculation of the associated set of source nodes on to the single sink node. The scale_method parameter includes sum, min, max, and averages ariave, harave, geoave. For all positive data sets containing at least one pair of nonequal values, the harmonic mean is always the least of the three means, while the arithmetic mean is always the greatest of the three and the geometric mean is always in between. Keywords appearing after the source cmo attribute name are optional and may appear in any order. cmosink, attsink are the cmo name and attribute name to write sink values into. The scale method detirmines which calculation is applied to the source attribute value and written to the sink attribute. All integer attributes are converted to double for the calculations. The resulting values are then converted to the nearest integer if the sink attribute is integer. cmosrc, attsrc are the cmo name and attribute name are the cmo and attribute to interpolate from. Points from the source grid will be located within the Voronoi volumes of sink nodes. The following parameters are optional for the command upscale. boundary_choice provides a method of choice when source nodes are found on the boundary of multiple Voronoi volumes of sink nodes. By default, each set of souce nodes found within each volume are used to calculate an upscale value for the sink node. In this case if duplicate nodes occur on multiple cells, the sum number of nodes used in upscale calculations will exceed the sum total of nodes in the source mesh. If the number of source nodes used must equal the number of source mesh nodes, choose an boundary_choice to detirmine which sink volume an boundary node should be assigned to. The result is a one-to-one correspondence with each source point assigned to a single sink node id which is stored in source attribute pt_gtg. Source nodes that are found on shared Voronoi boundaries are flagged in source attribute dups_gtg. single selects the Voronoi volume of the first sink node encountered and does not use any after that. multiple uses all source nodes found in each sink Voronoi volume. att_option is used during multiple calls to upscale with the same two grids. It keeps source attributes created during the search routines and uses these attributes to look up associated node numbers. The upscale command uses kdtree to create the source attribute pt_gtg that associates source nodes to sink node volumes. Note that this correlation is one-to-one and source nodes sharing multiple Voronoi volume boundary are tagged in a second source attribute called dups_gtg. delatt deletes any attributes created during the kdtree searches. By default these attributes are removed. keepatt keeps attributes pt_gtg and dups_gtg created during the kdtree searches. The source node attribute pt_gtg has the first found sink node id. The node attribute dups_gtg is flagged each time the source node occurs in a sink Voronoi cell, allowing the user to find source nodes on cell boundaries. Use of this attribute will greatly reduce CPU time. set_id creates and keeps the source attribute pt_gtg containing sink id numbers found from the sink mesh. This is the same attribute created and kept for the keepatt option except that if the attribute already exists, it is deleted and re-created with a new search. This is recomended if the pt_gtg attribute exists, but user is not sure the current sink mesh is the same as used to create the attribute. Upscale 1221 source points to 10 sink points with using method sum and showing the difference between allowing multiple use of nodes on Voronoi cell boundaries and the single option which uses nodes on cell boundaries only once. Images showing the source and sink points are shown below. will be counted regardless if     the duplicate boundary points. and are in multiple Voronoi       deleted. be a sum of points used greater   number of nodes used. pt_gtg attribute added to sou      nodes on Voronoi boundaries s     rce cmo. et to a single source volume. dups_gtg attribute added to s      pt_gtg being used for sink no     ource cmo. de id numbers. 1221 Total source                                         nodes searched. UPSCALE/sum/ from imt1 to ico  unt Done. unt Done. These images show the 10 numbered sink points and the 1221 source points. 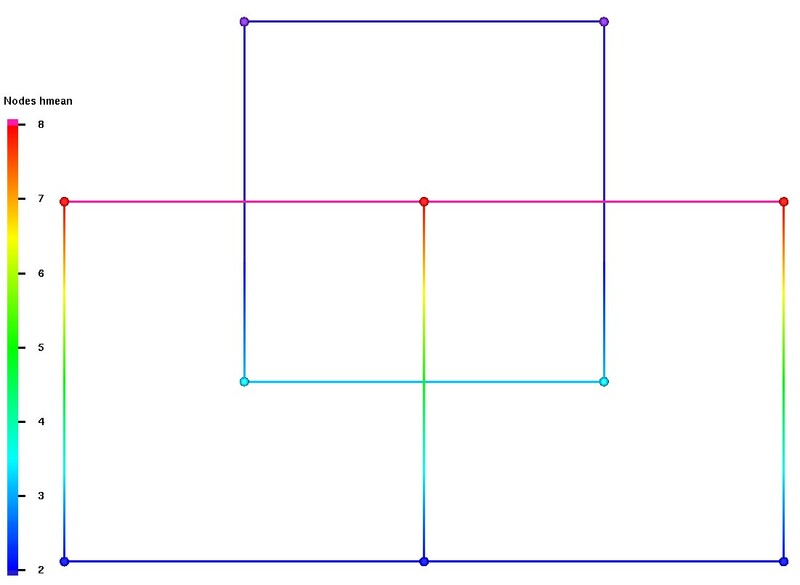 In this example all source points have an imt1 value of 1. The sink points each have a value in icount equal to the number of nodes used for the associated Voronoi volume. 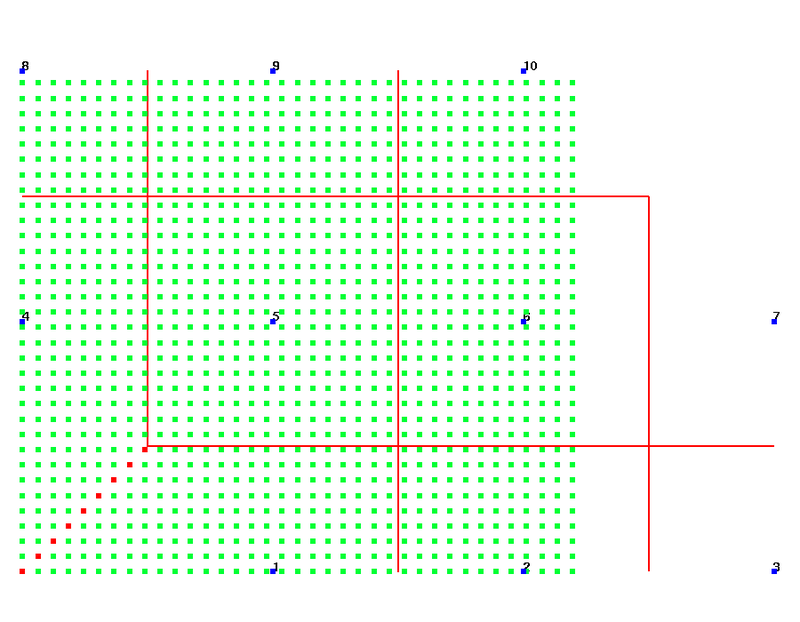 The red lines show the Voronoi cell boundaries for the 10 sink points. 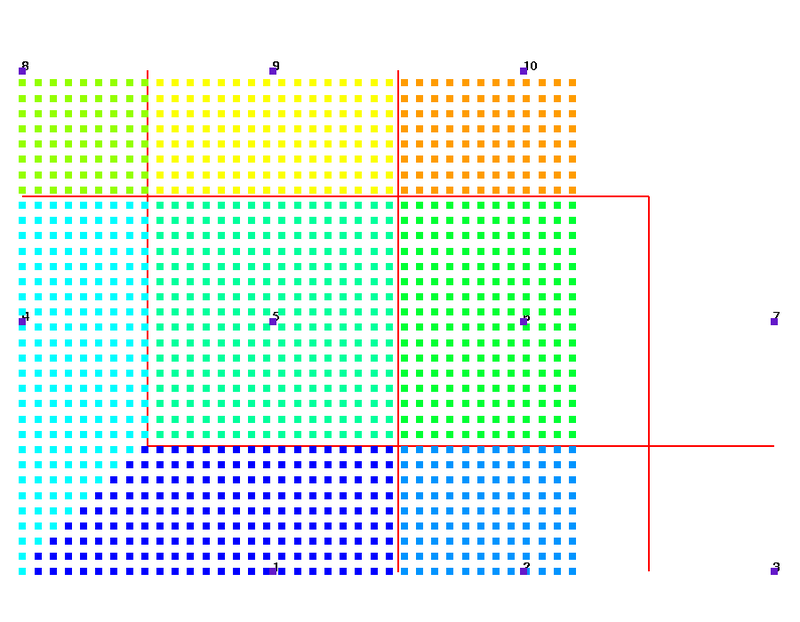 Sink points colored by upscaled value. Source points colored by associated sink node id, attribute pt_gtg. 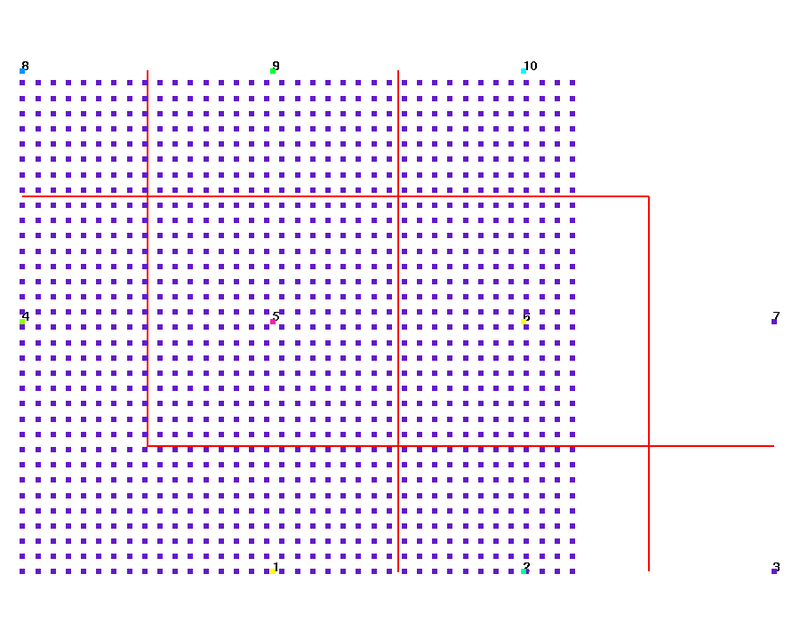 cell boundaries, attribute dups_gtg. Source points colored by number of duplicates. Show results for the 3 versions of mean calcuations. Source nodes are on the two adjacent quad elements. 6 Total source nodes searched. UPSCALE/ariave/ from xmean to amean Done. UPSCALE/geoave/ from xmean to gmean Done. UPSCALE/harave/ from xmean to hmean Done.